I’ve been nursing a sore left arm for the last several days. I’ve read that many pregnant women suffer from carpal tunnel syndrome typically during their second and third trimesters, and I’m afraid that I might have fallen victim to this dull aches in my hand and entire arm myself. I can tell you that this is definitely not a pleasant feeling. Thanks to my husband massaging my shoulders, back, and arms yesterday, I feel much better today, but he is still watching me like a hawk to make sure that I don’t make my way to the sewing machine, pick up knitting needles, or partake in activities that can possibly re-aggravate the pain. So, the only thing I can do right now is to quietly talk about my latest craft project here! I made three matching receiving blankets this week, using Aloha Flannel Floral Surf fabrics in blue, green, and yellow. I personally don’t like designs that are too baby-like (like those overly cutesy animal prints, etc.) so this subtle and quite design definitely struck a chord with me. These receiving blankets are very easy to make and it probably doesn’t require a tutorial, but I’m posting a very rough instruction here, just so that I have a record of it. I’m honored if any of you out there find this to be helpful. 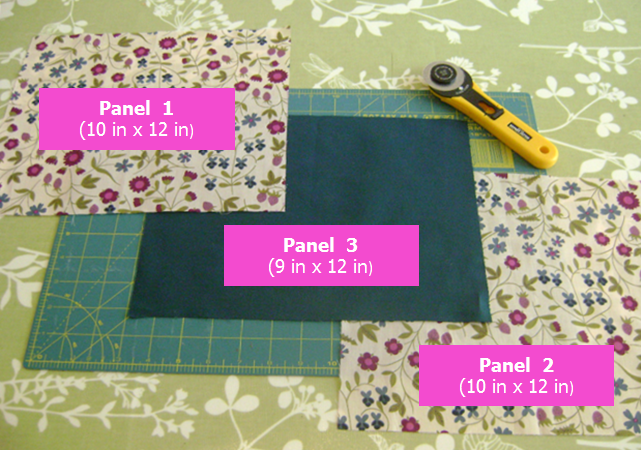 Cut the Front and Back Panels to measure 36 inches by 36 inches (you can make it larger or smaller). I used a rotary cutter to cut the fabrics. Put Front Panel and Back Panel together, right sides together. 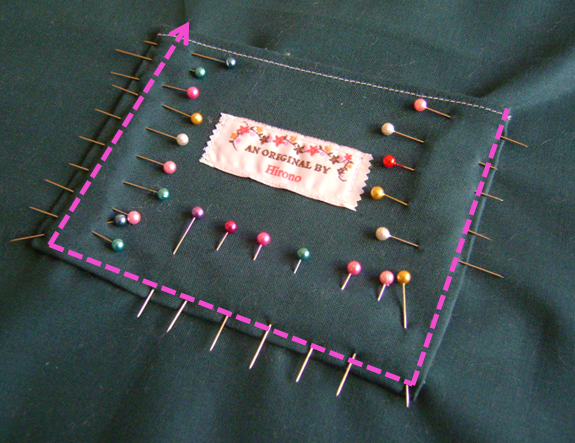 Pin all sides to avoid any unwanted creases and to ensure that fabrics stay together. 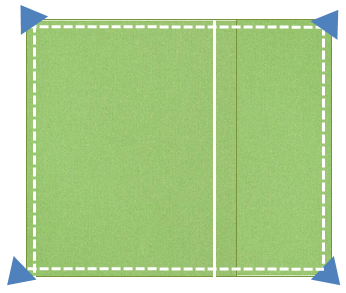 Use a saucer or a small plate to trace the rounded corners on all four corners. 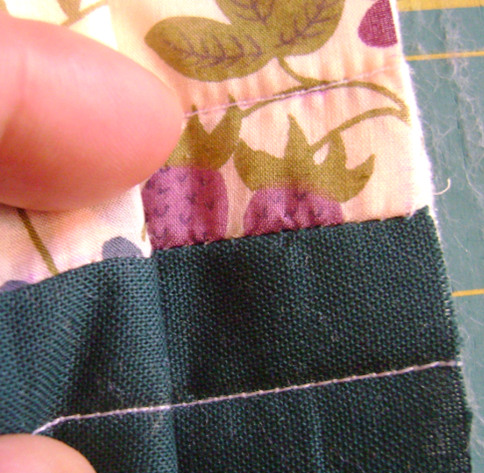 Sew around all edges (1/4 inch seam allowance), but leave a small opening at the bottom. Make sure to back stitch the openings to ensure there are no loose threads. Trim all access fabrics. Iron the fabrics open and turn the panels inside out. Hand-stitch the lining opening (you can skip this step if you like, since we’ll top stitch the entire blanket). Iron the fabrics. Top stitch around the blanket (about 1/2 inches from the edges). That is all! Mrs. Penguin seems to like the blanket. Thank you for coming out of your hibernation to pose for the photo. What I thought would be a relaxing Sunday afternoon was briefly interrupted by Women’s World Cup soccer final against U.S. and Japan, which ended in a dramatic fashion that reminded us of the Miracle on Ice hockey game when the underdog U.S. beat the Russians in the 1980 Winter Olympics. Unfortunately for American fans, it was Japan that came from behind in regulation and beat the U.S. in Penalty Kick that earned them the title of the champions. It was particularly exciting for me because I was rooting for both teams but it was also a double-edge sword because one of my favorite teams was guaranteed to lose. This time, I think the right team won the game. The U.S. team could probably beat the Japanese team if they played a game tomorrow, but this was Japan’s day. It really felt like the women carried the hopes of the entire nation on their shoulder, which suffered so many unspeakable tragedies already this year. There was nothing that was going to get in the way of their destiny. I was so proud of what I saw on the field, and made me even more proud to be Japanese. And of course, the grace of the American team, despite the bitter loss, made me happy to call myself an American as well. I was glued to my computer to watch the streaming game on EPSN.com (I cancelled my cable last month so I watch everything online now) but before the game and during the intermission, I sewed up very easy but adorable cushion covers for four cushions I recently purchased, to jazz up our living room. I should really change the blog name to “Ode to Liberty fabrics.” I’m just so in love with these fabrics that I can’t stop making things from them. For the project, I used the same Mirabelle E fabric that I used to make the “Tween-y” bag (with Kona Cotton in Bubblegum) and Lauren Blue / Green that I also used to make the Pencil Case (with Kona Cotton in Asparagus for the back). This is really simple to make and I absolutely love it. Each case will only take you no more than 30 minutes so you can make it during an intermission of a sporting game! Select two fabrics to use. I recommend that you use your favorite print for the front, and a subtle solid for the back. Note: Although I purchased these cushioned that were labeled 18 x 18, I found that there were a little smaller than that (due to girth, I’m sure). So the 18 x 18 panel will fit the cushion perfectly. 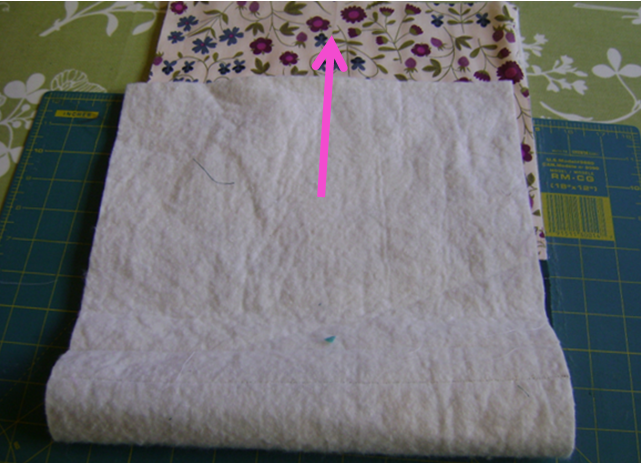 Fold over ¼ inch from the side that measures 18 inches from each of Back Panel and sew them together. This is so that the opening of the case will be free of loose threads. Put the Back Panels on the Front Panel, with Right Sides facing together. 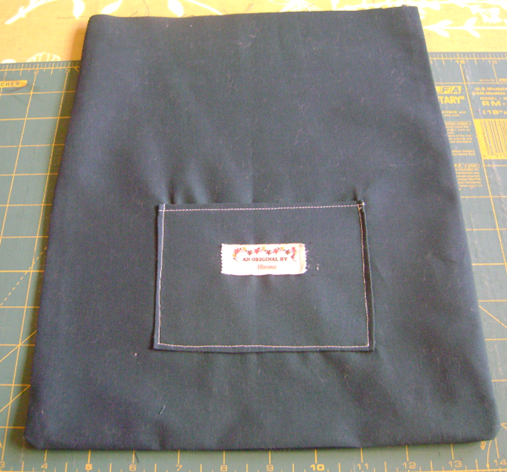 Sew all around the square (the sewing allowance is at ½ inch). Cut the tip of each corner (shown by the blue triangle). 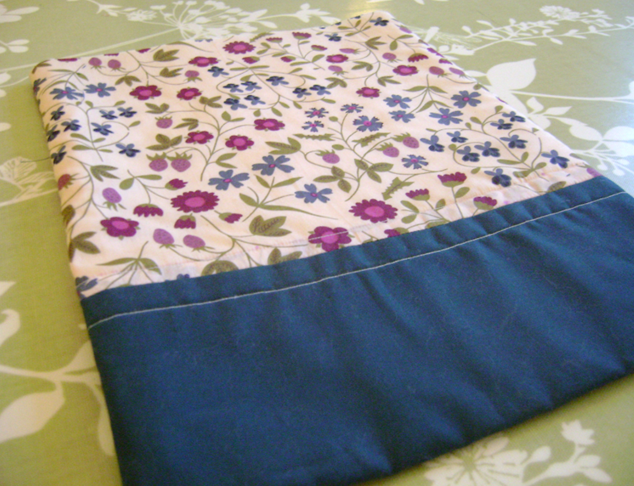 Open up seams on all sides and press with an iron. Flip the case. Iron the edges, front, and back panels. Insert the cushion in the case. “Tween-y Bag” Tutorial: Part 5: Putting it all Together! Okay, time to get to work! Now that you’ve done all the prep work, you’re ready to sew together two panels – the Front Panel and the Lining – to put the bag together. Isn’t it great that everything is coming together? First, turn the Front Panel you made on Part 2 tutorial over to the wrong side so that the batting side is showing. 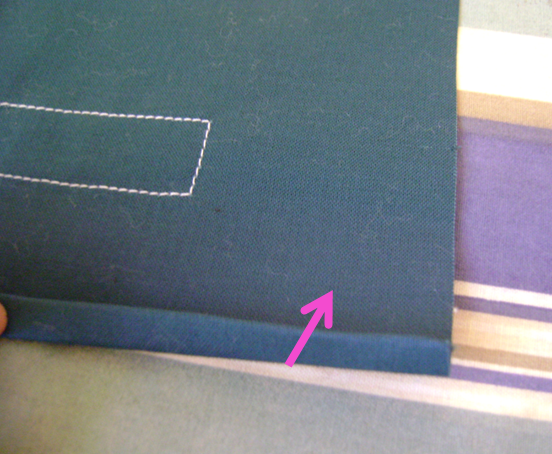 The Lining that you made on Part 3 Tutorial should be showing the right side, with the pocket side facing out. Shove the Lining in to the Front Panel. Align the top edges so that two panels fit perfectly together. You might have to put your hand in the bag to straighten the lining inside, to make sure that you have the Lining in perfectly, wrinkle free. Pin around the top edges to secure the Front Panel and the Lining. As mentioned before, use as many pins as possible. The more you secure the fabrics, easier it will be to sew around them. Here’s the fun part. After you finish sewing around and removed all the pins, yank out the Lining from inside the Front Panel. 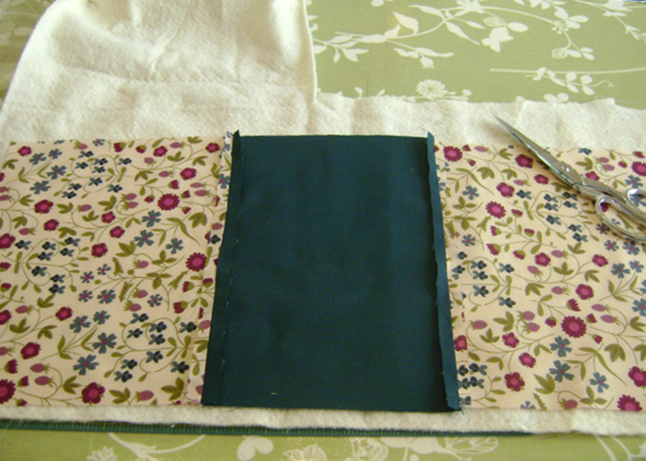 Next, from the opening on the bottom of the Lining (remember you kept a small section opened when you made the Lining? ), bring the Front Panel and the Adjustable Strap through. Take the Lining and put it back into the inside of the Front Panel. Iron the Front Panel and Lining. This is the final step! You’re almost there! Now, you’re ready to cast the Drawstrings through the Slots! Put a safety pin on the end of one of the drawstrings. Cast the drawstring through both both Drawstring Slots, all the way around the entire bag. Take two loose ends of the Drawstring and sew them together. Shuffle the Drawstrings around so that the sewn part will be hidden in the Drawstring Slot. Repeat for the second Drawstring. 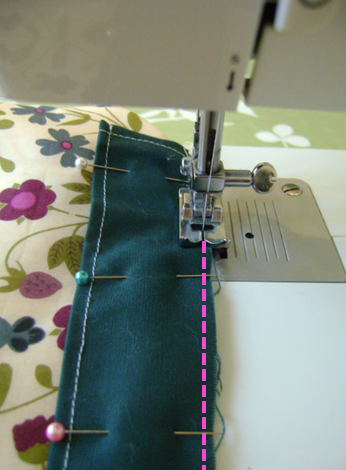 For the second one, make sure that you start the insert of the Drawstring from the other opening. That’s it! You’ve just sewn your Tween-y Bag! Congratulations! I hope you had as much fun making this bag, as I had with creating the tutorial. One of my favorite parts of this bag is that you can carry it as a drawstring bag, or carry it as a small, shoulder bag. Because the strap is adjustable, you can change the style up, based on your mood or wardrobe. The possibility is endless. 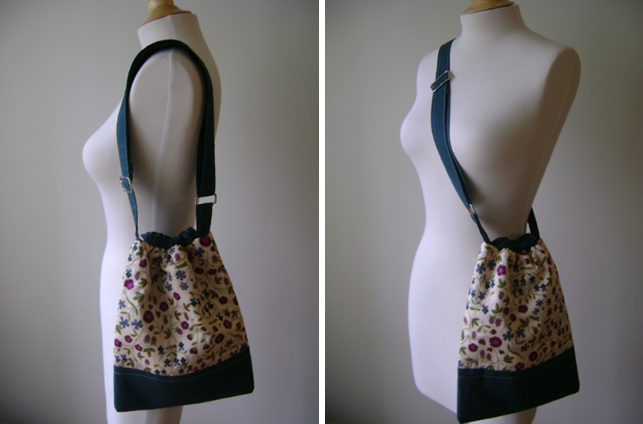 If you make this Tween-y Bag using the tutorial, I would love to hear your feedback! Please leave me a comment with your thoughts. If you have a blog and if you happen to feature the bag on it, I would love it if you can send me the link so that I can re-feature it on this blog. 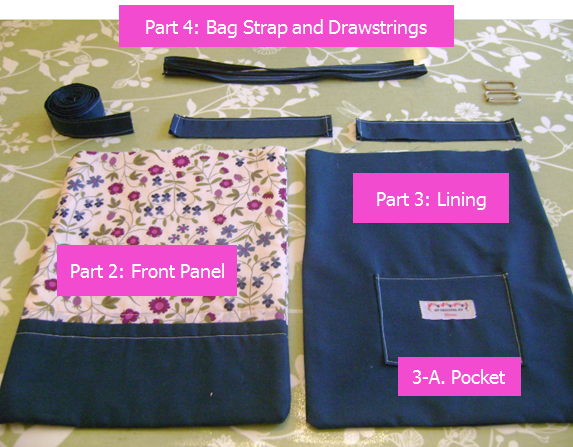 Welcome to “Tween-y Bag” Tutorial Part 4: Making the Bag Strap and Drawstrings! 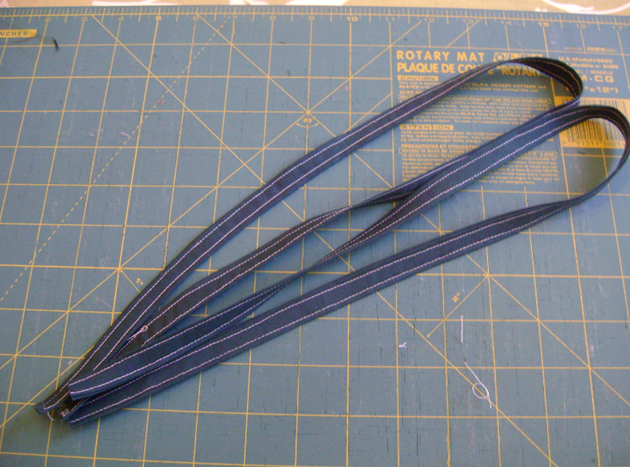 Now that you’ve completed the Front Panel and the Lining of the bag, you’re ready to move on to making two different kinds of straps, also known as bias tapes. As always, please read the introductory post, “Getting Started,” to find out important information before proceeding. What’s good about making a bias tape is once you learn how to make one, you can make it in any size imaginable. So, let’s make the Bag Strap first. 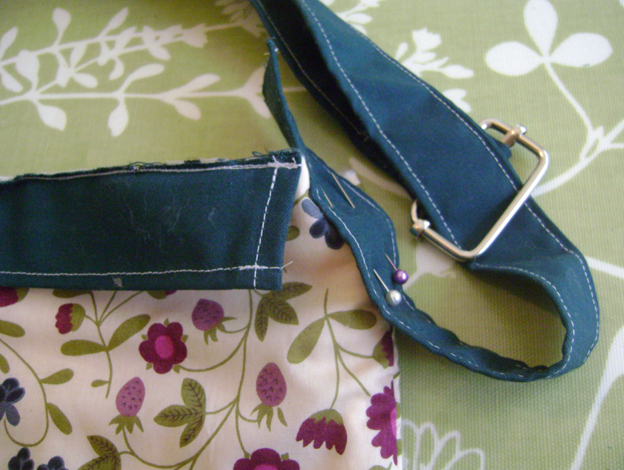 For the Bag Strap, cut a fabric that measure 5 inches by 50 inches. I used the dark green fabric again for this. Don’t worry if you don’t have a fabric long enough to add up to 50 inches. All you have to do is connect smaller pieces together to achieve the desired length. 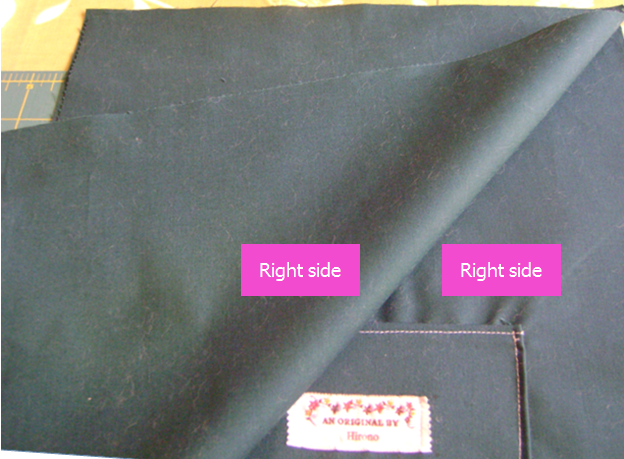 Align and sew two short edges of the same-size fabrics together. When done, flip the fabric with wrong side facing up and iron the seams to open them up. Turn the fabric over and iron the other side. Look, now you have a perfectly connected fabric! Repeat until you achieve 50 inches in length. 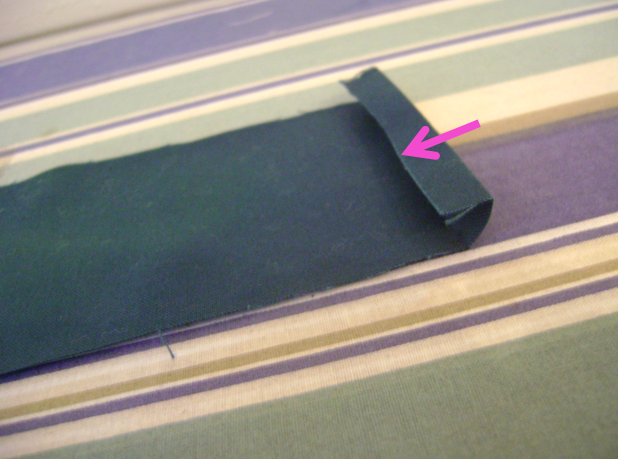 To make the Bag Strap (Bias Tape), first fold the fabric in half and iron, to create a visible crease. 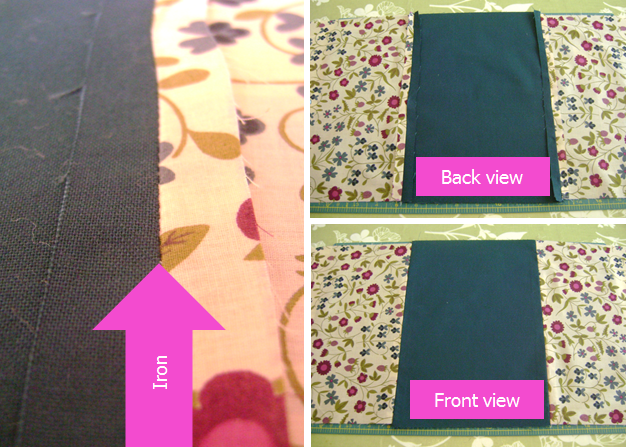 Next, bring each long end of the fabric to the center (you can use the iron crease to guide you) and iron. Bring two sides together, meeting in the middle. Iron the Strap down. The more you iron, easier it’ll be when you sew both sides together. 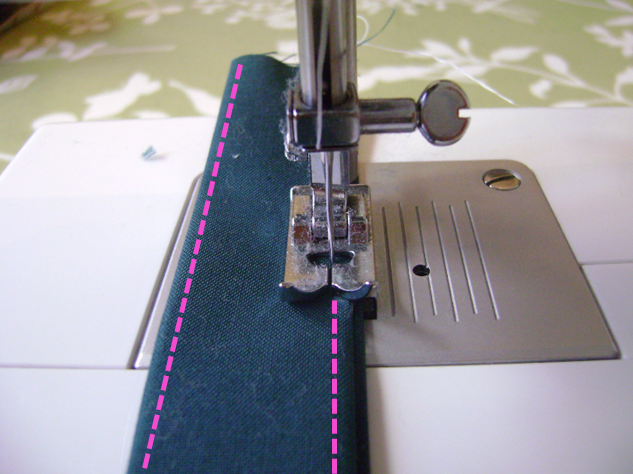 Sew down both sides of the Strap. 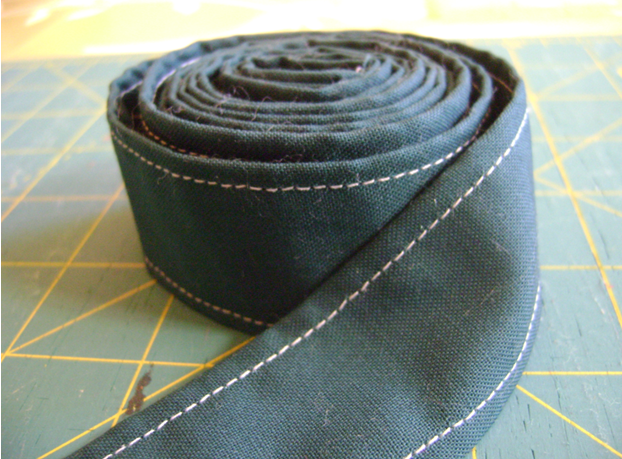 This makes the Strap a lot more durable than if you only had one side sewn together. YAY — you just created the Strap for the bag! Now, you’re going to cut two pieces of fabric that measure 2 inches x 29 inches each, to make the Drawstrings. 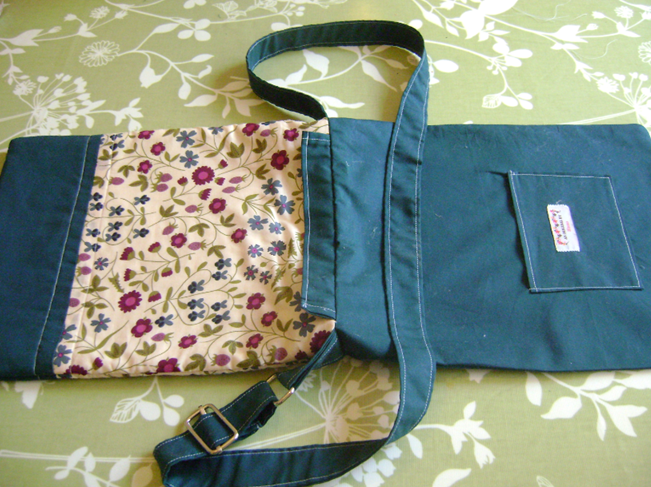 Repeat the same process of creating Bag Straps to make a Drawstring. Repeat the entire process again for the second Drawstring. Okay, I need to admit that I don’t know the proper name for these pieces, but these are the fabric “tunnels” that you cast the drawstrings through. 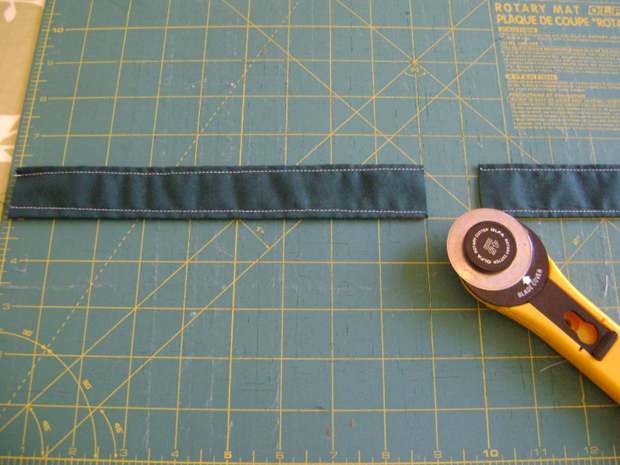 Cut two pieces of fabric that measure 3 inches by 10 inches each. First, fold a tiny piece from the edge (about ¼ in) and fold again, tucking in the first folded piece. Sew both sides. 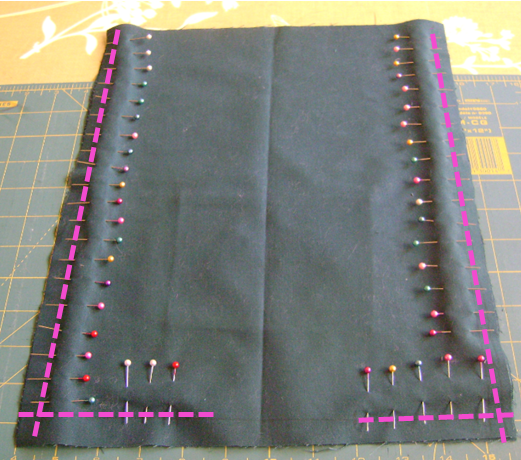 This is very similar to the way you make the pocket in Part 3 when you made the pocket in the Lining. Next, fold the wrong sides together in half, and iron. 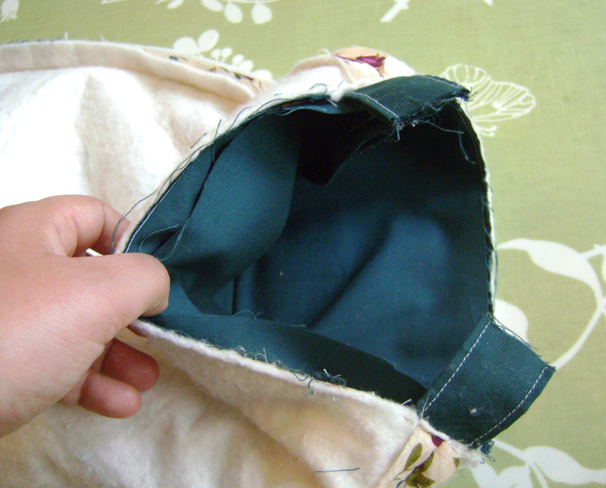 Sew the top part (the closed edge) of the Drawstring Slot together. You can keep the bottom unsewn. Repeat the same process for the second piece. 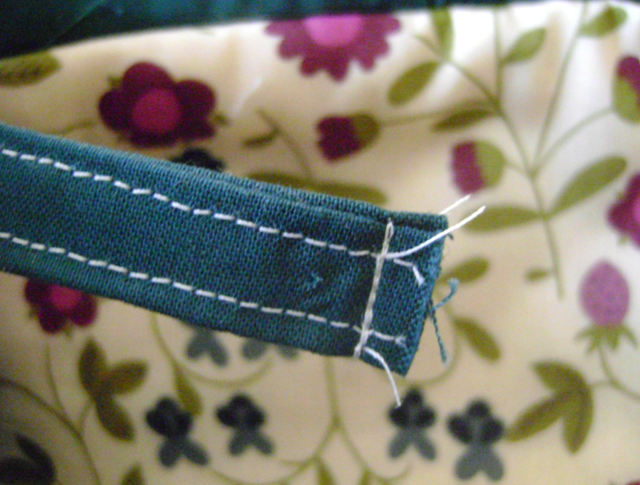 Now, pin the Drawstring Slots on to each top edge of the bag, with right sides facing each other. Make sure to sew as close to the top edge as possible. It’s pretty much like basting where the purpose is to temporarily sew two fabrics together to keep them in place. This will make it easier when it’s time to sew the Front Panel and Lining together. The bag should look like this now. You are now ready to put the Bag Strap into the Slider and Rectangle Ring set to make it adjustable. First, cut 9 inches from the Bag Strap you made. This will be used to hold the rectangle ring on one side of the bag. Trying to explain how to loop the strap to the ring is a little difficult; therefore, I’m going to rely on some helpful online tutorial for it. 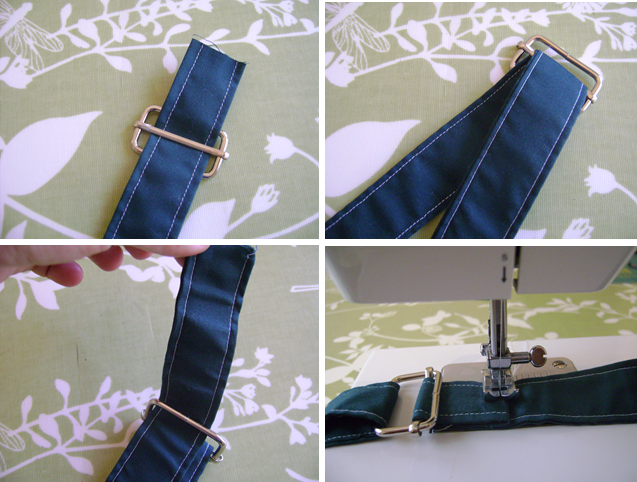 I recommend this online tutorial “Adjustable Strap Tutorial” by homespunthreds. She keeps it simple and it’s really easy to follow. If you enter in the keyword, “Adjustable Strap tutorial,”on YouTube, you will find many, other helpful videos. Pin each end of the Strap to both sides of the bag. Put right sides together on both edges. 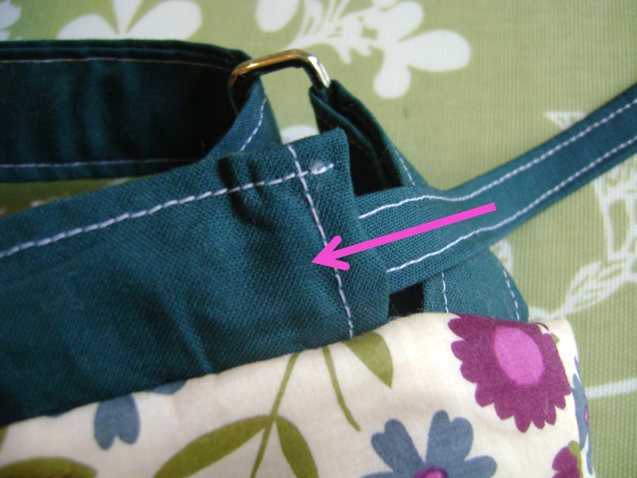 Just like what you did basted the Drawstring Slots, this step allows you to detect any potential pitfalls, such as twisting the strap or sewing it on the right direction, before you sew the Front Panel and Lining together. 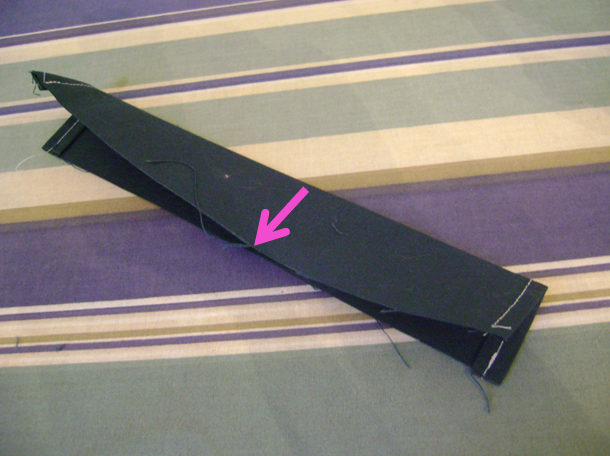 Baste the Strap, sewing as close to the edge as possible. Look, the bag is coming along beautifully together! 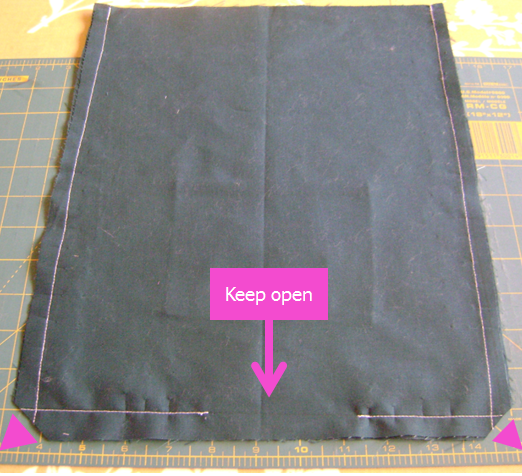 Welcome to “Tween-y Bag” Tutorial Part 3: Making the Lining! 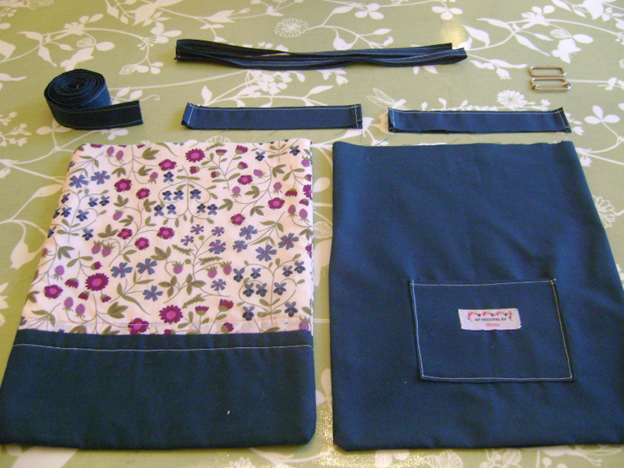 Now that you’ve completed the Front Panel of the bag, you’re ready to move on to making the Lining. As always, please read the introductory post, “Getting Started,” to find out important information before proceeding. 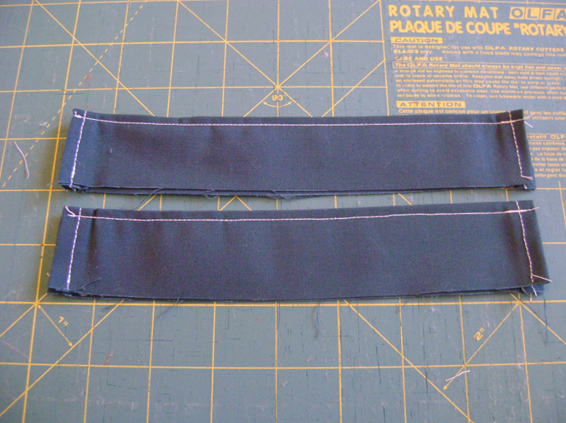 For the Lining, let’s begin by cutting two identical pieces – 12 inches by 14 inches. I selected the same Kona Cotton Spruce, the dark green fabric that I used for the part of the Front Panel. This bag is really a reversal bag, so if you want to take the time to repeat the same process for the Front Panel, you certainly can. I personally love the darker liner, so I’m going to go with this lovely dark Starbucks-esque green fabric. 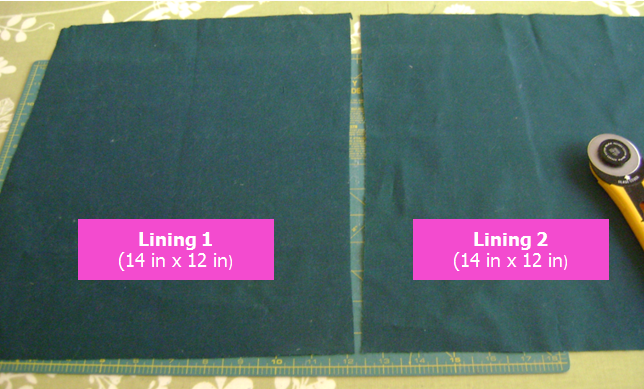 You will sew on a pocket on to the Lining 1, but first, let’s make the actual pocket by cutting out a fabric that measure 6 inches x 5 inches. 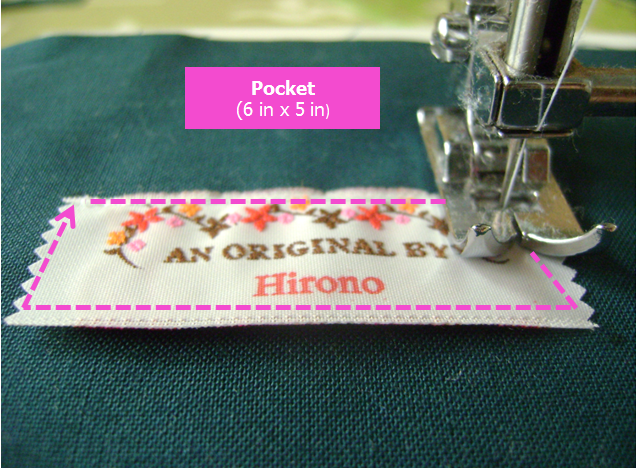 If you have a personalized tag or label, this is the time for you to sew it on the pocket. I purchased a personalized woven clothing labels from a place called Namemaker that specializes in personalized tags, ribbons, etc. They are great. If you sew frequently or enjoy making handmade gifts, I recommend that you invest in your own label. It just makes everything you make that much more special. 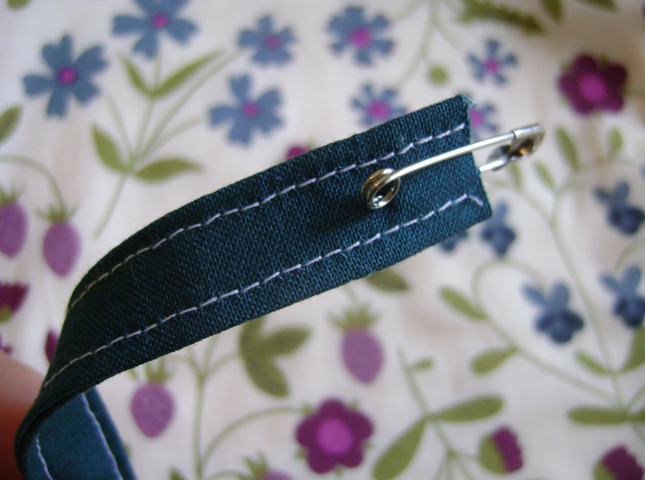 Simply place the tag on the pocket and sew around it. Next, sew the top edge of the pocket. 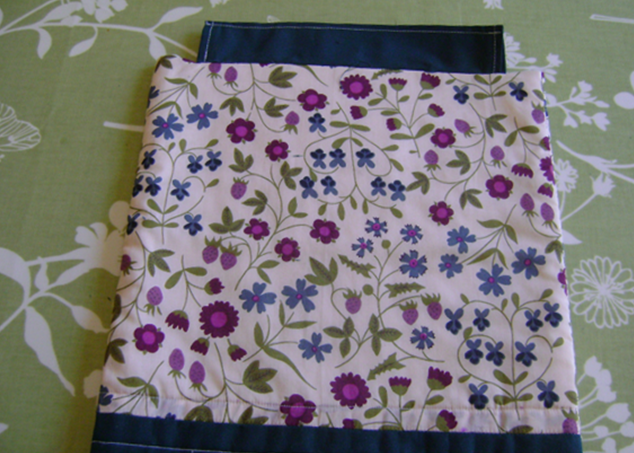 What I did here is I folded a small piece, about ¼ inch and folded the piece again before I sew the crease together. This way, you don’t have little loose threads sticking out from the top of the pocket. It’s worth it to take the extra step to do this as the end result looks will look much more professional. 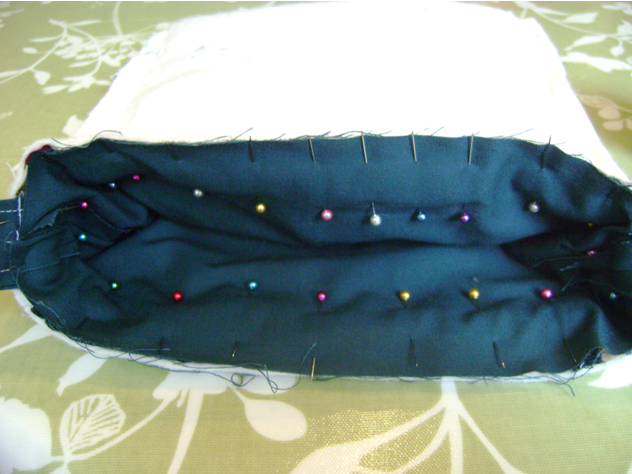 After that, simply pin all sides down to secure the pocket to Lining 1, and sew around it. Now, put two Lining panels together, with right sides facing each other. At this point, the side with a pocket should be hidden. 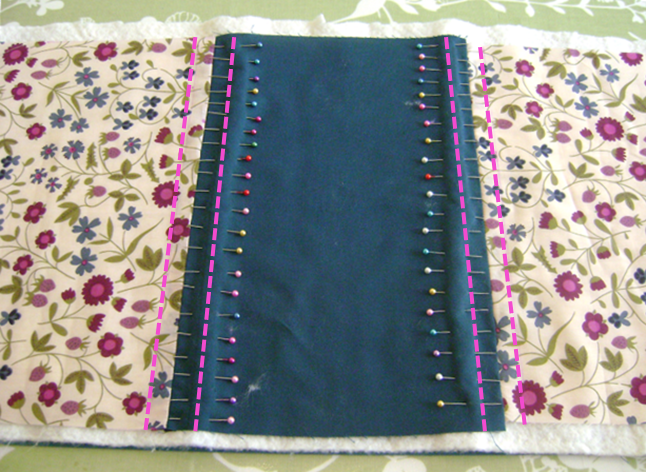 Pin three sides (the top will remain open) and sew them together. The seam allowance is ½ inch. Make sure to leave a little opening at the very bottom. You’ll need this opening when you “flip” the bag inside out. If that makes no sense, don’t worry. It’ll all come together a little later. Also, clip the bottom corners. 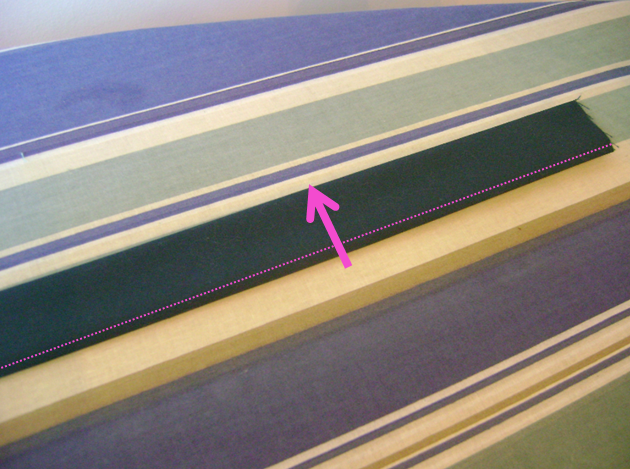 This will make the corners look sharp when you turn the Lining over. Iron the seams open on all three sides. . Turn over the panel, and iron again, making sure to iron the open sides carefully. Guess what? You’re all done with the Lining! YAY! 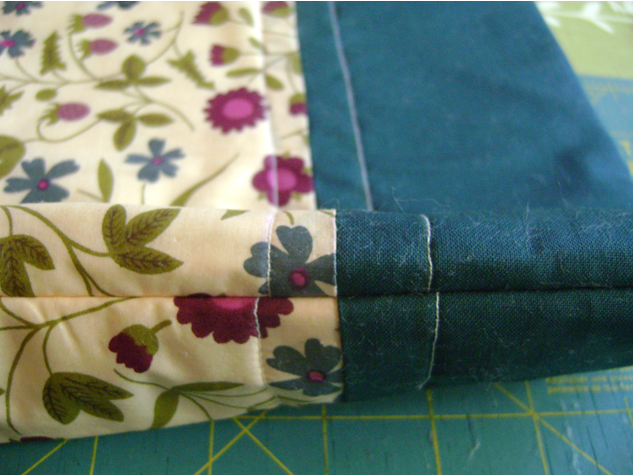 Welcome to Part 2 of the “Tween-y Bag” Tutorial: Making the Front Panel. Before proceeding with the tutorial, please read the introductory post, “Getting Started,” to find out important information. 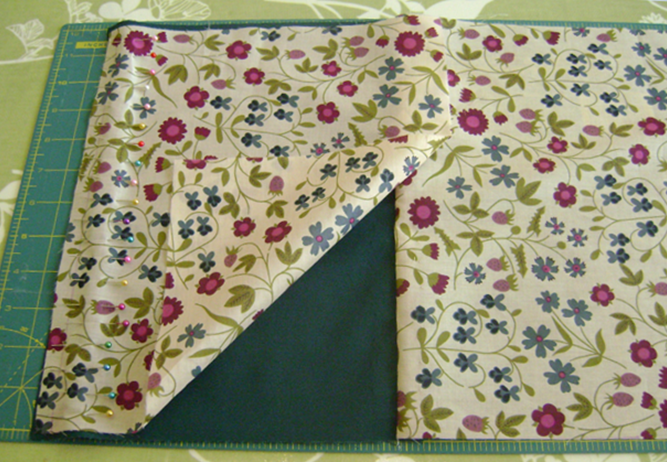 Once you’ve read Part I and decided on which fabrics to use, you’re ready to get started on making the Front Panel. The first thing you need to do is cut Panels 1, 2, and 3 based on the above dimensions. These three fabric pieces sewn together, along with the batting, will make up the Front Panel. By the way, I love using a rotary cutter for something that is perfectly square. It’s such a great investment. And make sure that you purchase a durable rotary mat too! 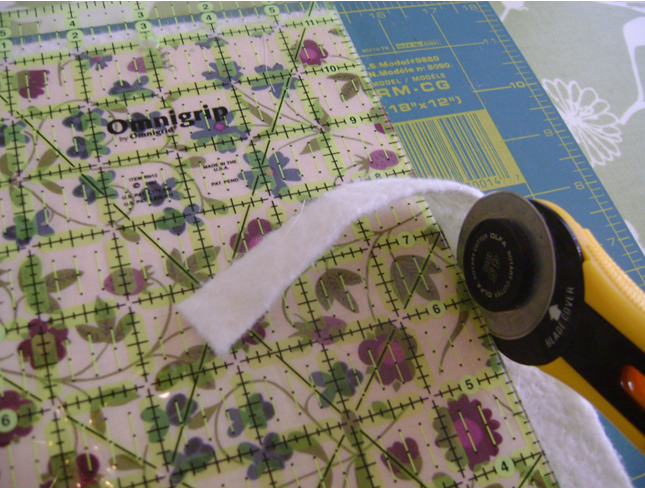 Here’s a wonderful tutorial on how to use a rotary cutter, from PurlBee. Next, sew Panel 1 onto Pane 3, aligning the sides that measure 12 inches. 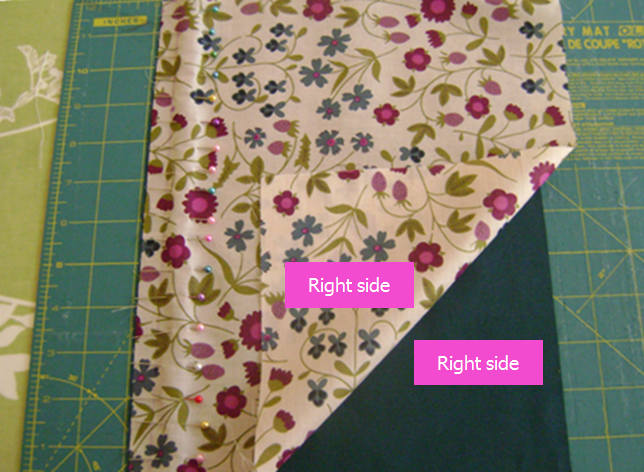 When you are putting two fabrics together, make sure to put the right sides together. 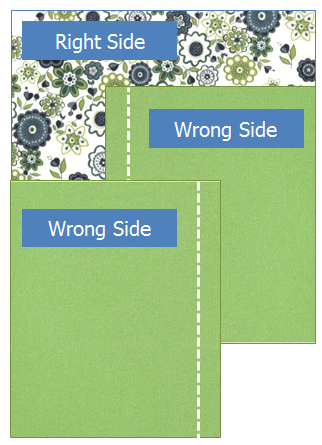 When I say the “right side,” I’m referring to the side that will show up on front (sorry, it’s a little difficult to determine which is the “right side” with this fabric since both sides look the same … I’ll make a note to use a better fabric for the next tutorial). Whenever I put two right sides together, I imagine the fabrics “kissing” each other … LOL. I know it’s silly, but that’s how I remember which is the right side of a fabric. Or just think … front = right; back = wrong. Once you put the fabrics together, get out your pins and pin the sides down. Don’t be shy – use as many pins as possible. The more pins you use, the more secure your fabrics will be. I call this a “Hellraiser” process because there are so many … well, pins! I also mark the ½ inch seam allowance with an erasable pen (please note that all the seam allowances in the pattern is ½ inch) . This way, I know exactly where to sew! Now, you’re ready to sew Panel 2 onto the other side of Panel 3. Repeat the same steps you took to put Panel 1 and Panel 3 together. Don’t forget to pin the two fabrics down, and draw a straight line with an erasable pen again. Next, you’re going use the iron to open up the seams. What I mean by this is that you should run your iron between two, closed seams to open them up. Please trust me when I tell you that this step makes a whole a lot of difference. 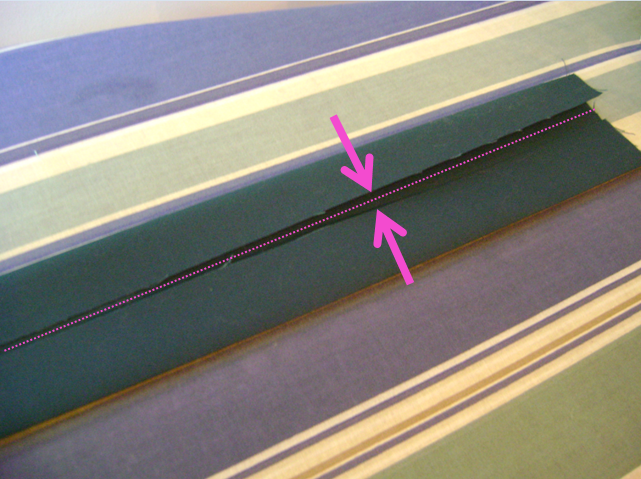 By taking this extra step, you’ll end up with wonderful, clean seams when you turn over the fabrics. Now, you’re ready to get your batting out and cut it out to match the size of the Front Panel (should now measure at 12 in x 27 in). I’m sure if you go to a proper sewing class, an instructor will tell you to have all the pieces cut, ironed, and ready to go before you begin sewing. Well, I’m a little bit more … how should I put this … carefree (or lazy) … so, what I do is place the Front Panel directly onto the batting and simply cut around it. 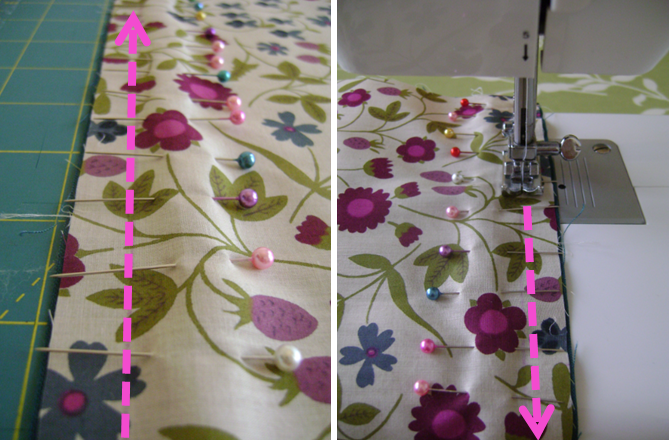 This way, you don’t have to take the extra time to measure yet another fabric, and you’re guaranteed to have the exact same size that you need. You don’t have to be exact with your cutting at this time. You’ll have a chance to go back and clean up all sides. 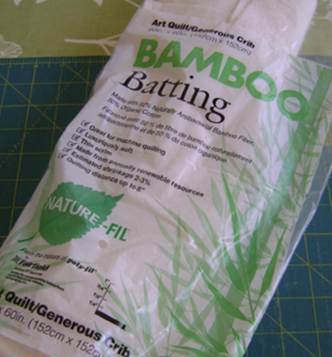 I used the Bamboo Batting that I’ve purchased at a neighborhood JoAnn’s (you can purchase it online at other retailers too). I love how soft it is, compared to other polyester batting in the market. Now, you’re ready to quilt the Front Panel and the batting together. Again, use as many pins as possible to secure the Front Panel with the batting. You’re going to quilt in four different places: Two on the patterend parts and two on the solid sides. 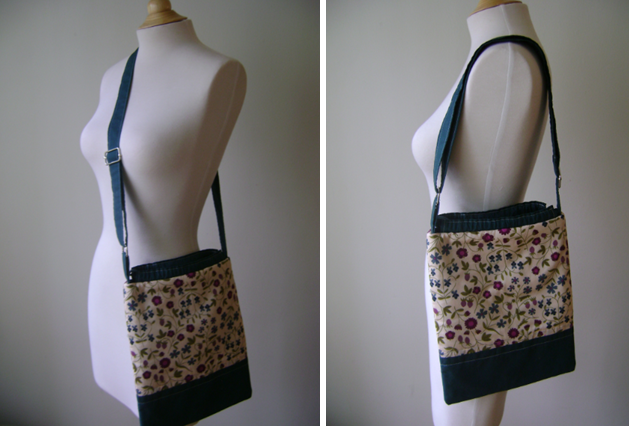 This allows two fabrics (the Front Pane and the batting) to stay together, and also provide a nice design to the bag. Since this is the side that will show up on front, make sure to take the time to sew straight lines. Don’t be afraid to re-sew, if you’re not happy with how they turn out. Once you’ve sewn and quilted the four parts, take the rotary cutter and trim around all edges, so that the Front Panel and the batting are exactly the same size. At this point, the Front Panel should measure at 12 inches (width) and 27 inches (length). Now, you’re ready to sew two sides together. Lay the Front Panel on a table, with the right side facing up. Bring the bottom of the Front Panel to alight with the top. You should only see the batting side (wrong side) now. Take the pins and pin down both sides. Note: This is important so please take note. When you fold and pin the Front Panel, it should be folded in a way that the solid fabric aligns perfectly. 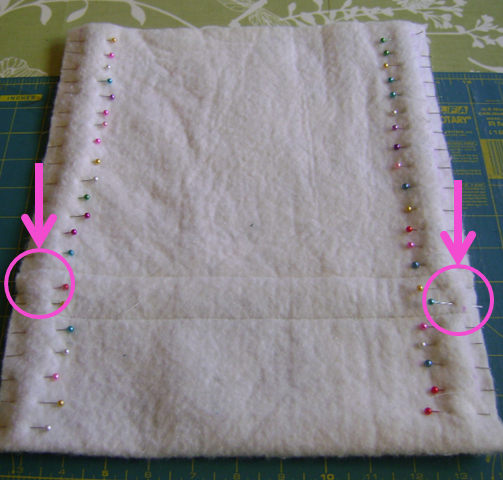 Please take the time to do this before you sew down the sides; it makes a different when you turn the fabrics over. This is something that will differentiate a bag that is “homemade,” versus something that is “handmade.” “Handmade” is wonderful but “homemade” gives a slightly unprofessional feel. The seams should look something like this. 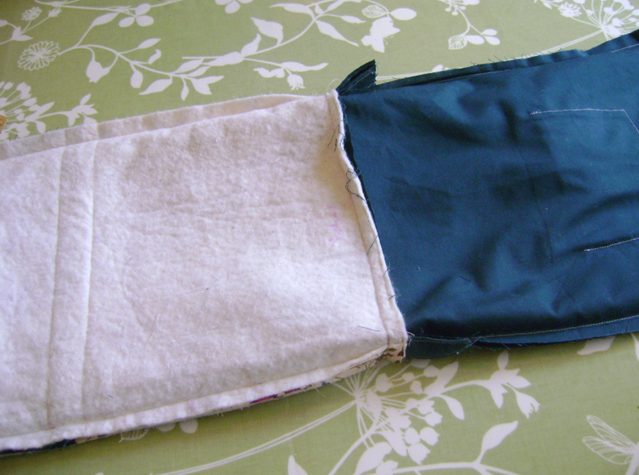 After you sew both sides together, make sure to iron both seams open. 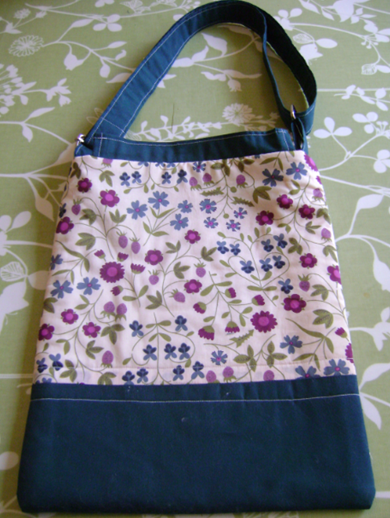 Turn the fabrics over, and voila, you’ve just completed the front of the bag! I think I was most awkward during my “tween” years. Tween is an age between 9-12 when you’re not quite a teenager yet but you’re not a little kid anymore. I was too old for The Smurfs and Care Bears but a little too young for boys and those stone-washed Guess jeans that my older sister and her friends were fashionably sporting. I really hated that there was really nothing cute in the mall for girls in this in-between stage when I was growing up in the mid-80s. When I was thinking about my next sewing project, I thought about those tween girls out there and started thinking about the kind of bag that they would enjoying carry around (or what I would have loved to have at that age) that allows them to celebrate their youth in style. 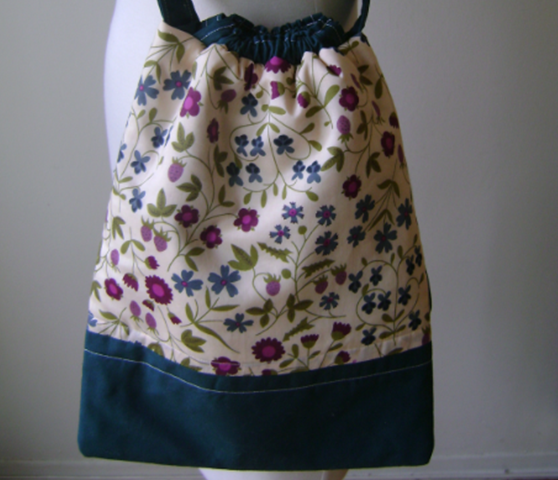 Then, I came up with this pattern … and the “Tween-y Bag” was born. I first posted about these versatile bags last week, and I loved the pattern that I came up with that I wanted to share it with you. So, who wants to make a simple, drawstring bag that your tween daughter (or a granddaughter, or a cousin, or a friend’s daughter, etc.) would love to carry around as she plays outside in the summertime? 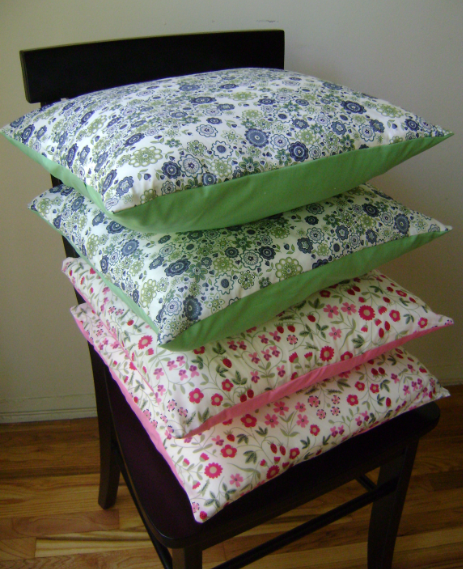 Or wants to sew a simple project that you can finish in one weekend afternoon? If you answered “yes” to any of the questions, this tutorial for the Tween-y Bag is for you! And the great thing about this bag is that, depending on the fabric designs you select, you can make it appropriate for any age (in fact, I use one myself and I’m thirty-@#%%^$@#)! I’ve decided to divide the tutorial into five parts: 1. Getting Started (this post); 2. Making the Front Panel; 3, Making the Lining; 4. Making the Bag Strap and Drawstrings; and 5. Putting Everything Together. 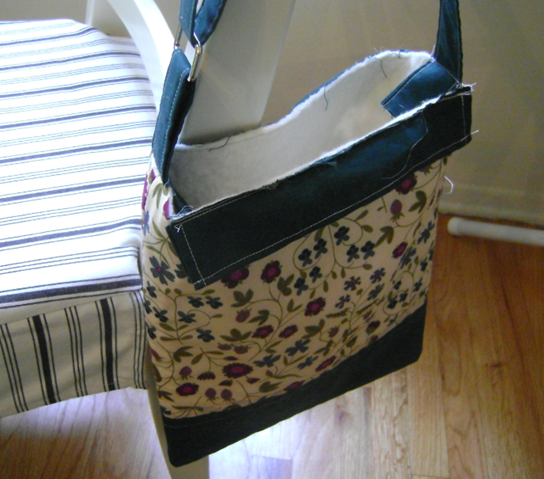 I would classify this project as “Intermediate Beginner” (which is how I would characterize my own sewing skills). If you have basic skills, like cutting fabric, operate a sewing machine, and understand the basic sewing terminologies, you’ll have no problem with it. Materials: These are the materials that you will need for the bag. I selected the Liberty of London fabric called Plum Mirabelle 6011C from the Tana Lawn Classics; and Kona Cotton Spruce. 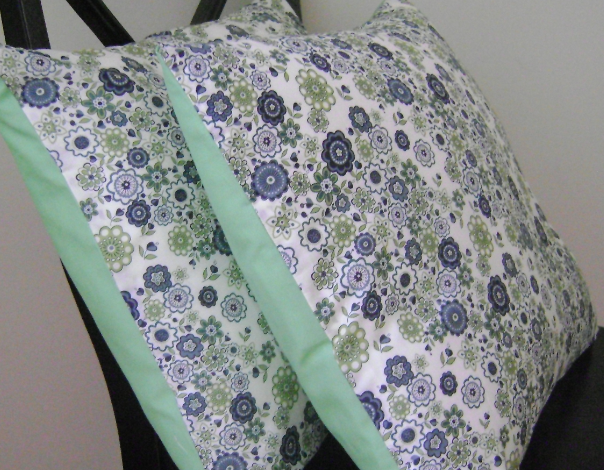 Both fabrics are wonderful and very easy to work with. And the Plum Mirabelle feels like pure silk! 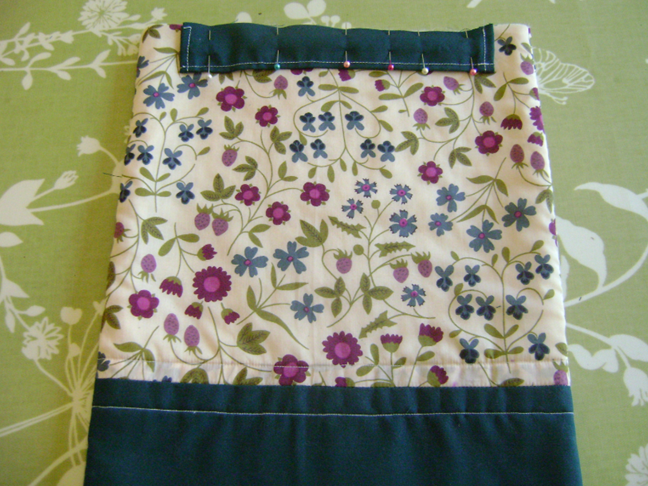 Next up is Part 2 of the “Tweeny-y Bag” Tutorial: Making the Front Panel!